Treats for Me! – IS HAPPINESS SPOON FED? I bought the one in the upper right hand corner. I took this picture from their facebook. I hope they don’t mind. My emotional attachment to food sometimes hits me in the smallest and most rare ways sometimes. I live only about three blocks from Reading Terminal Market. It is filled with delicacies and some of the best food in Philadelphia. If I stayed there a week- eating all day- I couldn’t eat all of the deliciousness there. It is number four on trip advisors best restaurants, and one of the restaurants – a donut shop – is number one. That shop, Beiler’s Bakery, is the first place I went Thursday. “Oh, no Danielle! Don’t eat donuts,” you say. I give you a discerning look. “Donut’s are fattening and you are trying to lose weight,” you gently remind me. If anyone said that to me a year ago, I would have said, “Whatever.” Then I would have gone back to Beiler’s and eaten a box of twelve in self deluded retaliation. However, I understand certain things about myself that I didn’t before. Losing weight can’t be about deprivation for me, more like allocation. I need to be able to eat a donut if I want, especially the apparent best donuts on the planet. In other words, if I say no donuts to myself eventually I will be down at that counter ordering up as many as I can afford. Last time I bought donuts a couple of months ago, I bought at least three for myself. Thursday I went to Beiler’s and ordered one, only one. I took it and a coffee and sat down at a metal table and took about thirty minutes enjoying it. Bite by bite I savored it and my surroundings. The fact that I didn’t go back and order two more is the success. I also remember it’s richness as well, and don’t believe I will need another one any time soon. Small decadent treats I believe are going to be my secret weapon in the battle of the bulge. In this spirit I bought another treat on my shopping trip. Along with the wise vegetables and meats in my cooler, a very special honey rolled home with me. When I was little, my Grandma used to serve this type of honey with breakfast. 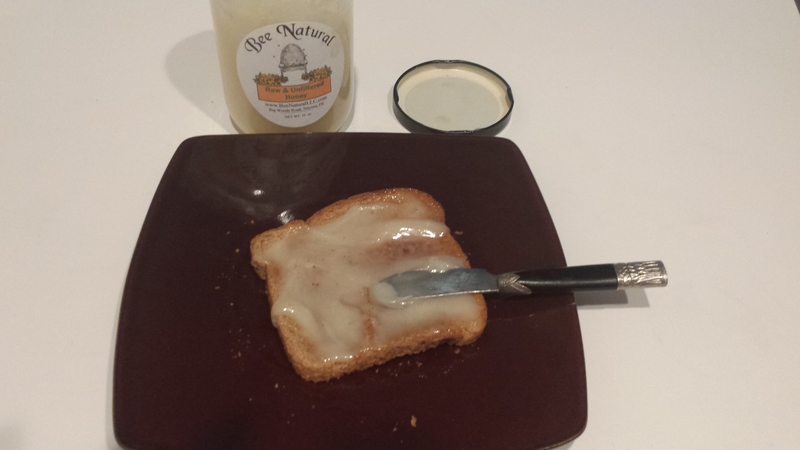 It is the raw light honey that you can spread over toast. I have bought it since, and time and time again it has turned out not to be the honey I remembered. Either it wasn’t sweet in the right way or it was so hard I couldn’t spread it. Finally at the market I found it. This morning for breakfast I tried it finally. I had made a frittata and cut up fruit (very healthy.) Then to add the finishing touches on our leisurely Saturday morning, we had a nice whole wheat toast with the holy grail of honey. As I bit into the pale golden elixir, I was transported back to the round hard table in my grandma’s kitchen, looking at her sweet rosy face and kind blue eyes. The electric coffee pot is gurgling in the corner, when I remember watching my Grandpa break up his poached eggs with his fork. Each bite solidified those memories down to the smell of the bacon left over on the stove. I am not familiar with Beiler’s Bakery.